The annual April event is open to the general public, and begins in the earliest time zones of Samoa at 10 am, and then participants across Oceania, Asia, Africa, Europe, North America, and South America take part, with celebrations in eighty nations and several hundred cities, ending with the final events in the last time zones of Hawaii almost an entire day later. Celebrations include mass t'ai chi ch'uan and qigong exhibitions in many cities, and free classes in most participating cities. Educate the world about emerging medical research revealing health benefits that t'ai chi ch'uan and qigong offer. Educate about the increasing use of these ancient traditional Chinese medicine modalities in business, healthcare, education, penal and drug rehabilitation. Provide a global vision of cooperation for health & healing purposes across geopolitical boundaries, and also an appeal to people worldwide to embrace wisdom from all the cultures of the world. Thank Chinese culture for the gifts of tai chi and qigong to the world. 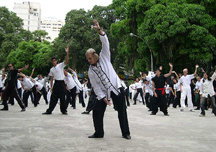 The local events are independently organized by local Tai Chi Chuan and Qigong schools, groups, and associations. The format of events varies by locality, although most involve free classes and mass exhibitions. International organizing for the event is done at the World Tai Chi and Qigong Day office in Overland Park, Kansas. The global event began in 1999. However the first event, that inspired the global event, was held in Kansas City, Missouri in 1998 on the lawn of the Nelson Atkins Museum of Art in midtown Kansas City, where the Kansas City Tai Chi Club held a mass Tai Chi exhibition and teach-in involving nearly two-hundred people. CNN Headline News covered the event, which generated interest beyond Kansas City to quickly grow into a national and international event in the following years. World Tai Chi and Qigong Day has been officially proclaimed by governors of twenty-five US states, the senates of California, New York, and Puerto Rico, by Brazil's National Council of Deputies, and officials in several nations. In 2013 Harvard Medical School launched a series of lectures regarding medical research on tai chi benefits. The Harvard lecture series homepage was titled "Celebrating World Tai Chi Day." "The Harvard Medical School Guide to Tai Chi," released in 2012, cited World Tai Chi Day, writing, "A reflection of how successful the invasion of [of tai chi] has been is World Tai Chi Day, organized by Bill Douglas. One of the purposes of this day is "to bring people across racial, economic, religious, and geo-political boundaries, to join together for the purpose of health and healing, providing an example to the world." Millions of people around the world—65 nations participated in 2011—gather one day each year to celebrate the health and healing benefits of Tai Chi and Qigong." This global event was founded by Bill Douglas and Angela Wong Douglas, co-authors of "The Complete Idiot's Guide to T'ai Chi and Qigong" (Penguin Alpha Books, fourth edition, 2012). Their book's chapter entitled, "World T'ai Chi and Qigong Day," was a major force behind the global awareness of this health and healing event. In 2013 the National Council of Deputies in Brazil joined 22 U.S. Governors, the Senates of California, New York, and Puerto Rico and other officials and bodies from around the world in recognizing World Tai Chi & Qigong Day. Local and national media worldwide have covered World Tai Chi & Qigong Day events, including Agence France Presse TV; Egyptian national television news; and New York City's Central Park event was covered by NDT Television News. This global healing event, in turn, inspired what is now known as World Healing Day. ^ "Chinese Martial Art in Latin America, BBC Television". April 28, 2013. ^ "Tai Chi: The No-Sweat Way to Boost Immunity, Prevention Magazine". November 2011. ^ "World Tai Chi Qigong Day Celebrated worldwide, CNN iReports". April 28, 2013. ^ "World Tai Chi & Qigong Day Celebrated in Israel, NTDTV Television". May 2, 2011. ^ "Gallery of Official Proclamations from Governments and Officials Worldwide, WorldTaiChiDay Official Proclamations Gallery". August 2013. ^ "World Tai Chi & Qigong Day Celebrated in Havana, Cuba, Agence France Presse Television". April 30, 2011. ^ "World Tai Chi & Qigong Day Celebrated in Cairo, Egypt, Egyptian national television news". May 7, 2011. ^ "World Tai Chi & Qigong Day Celebrated in New York City's Central Park, NDT Television News". April 30, 2011. This page was last edited on 7 May 2018, at 08:01 (UTC).